Note: This product is part of the Pathfinder Roleplaying Game Subscription. Short Version: Unless you use an alternate way to build NPCs, grab this. Building NPCs in Pathfinder can be one of the most time-consuming types of preparation. No book can contain all the NPCs you could ever want, but this one takes care of a broad swathe of them. This is one of the first books I'd suggest for a new GM, up there with the Bestiary. Particularly for groups that wander off the rails, and frankly that's almost all of them, having a slate of prebuilt NPCs to pull from can be a lifesaver. A perfect resource for easily assembling quality NPCs. Some take a bit more work, such as the arcane classes, but for the most part I can simply use the given stats for any NPC I need. I just wish it was updated to include newer classes, but that doesn't lessen the quality of what is here, which is fantastic. My only complaint is that I would have liked to see 2-3 levels of many of the NPCs represented. I love the tactics info and would love to see the PFS pregens get a tactics section. The best book hands down for Gamemasters. Perhaps one of the most valuable books ever made for GMs across all systems. Great source of ideas for players as the well. Even if you dont GM the art in this book is worth the cost alone. Get it! This is in my opinion Paizo's best work so far. The culmination and amalgamation of dozens of previous awesome work, finally used as they should be, and used to build the most fascinating monster encounters. Not only are the goblin gangs and hobgoblin patrols well assembled, but the book goes beyond and presents new and amazing feats, archetypes and magic items for these monsters. Finally the PCs can quake in their boots at fell magic that they are not prepared for, and the meaning of "you see five orcs, roll initiative" has now gained a whole new meaning. Announced for October! The cover image is a mockup, and will change prior to publication. That sounds very useful for any game master. Is it 250 unique NPCs or much less NPCS at various levels (I assume the former but I had to ask) ? This just replaced Shattered Star as the thing I'm most excited about. Interesting. This sounds like it could be very useful. One tiny question: Are any of the APG classes featured in this book? That was one of my question as well! My other question is: Will we see Seltyiel as a Magus/Eldritch Knight this time or will he still be a Fighter/Wizard/Eldritch Knight? Correct... this focuses pretty much entirely on NPCs made with Core Rulebook only options. so is it safe to pressume the High Queen of Stab is going to be in this book Mr. Jacobs? Unless we get an NPC Codex II using APG, UltM, and UltC, I am NOT a happy subscriber over this. I thought Paizo had moved on from the WotC school of "release a great big rules book and never mention its contents again". Edit: Could we at least get stat treatments for the Iconics from the other base classes, if nothing else? 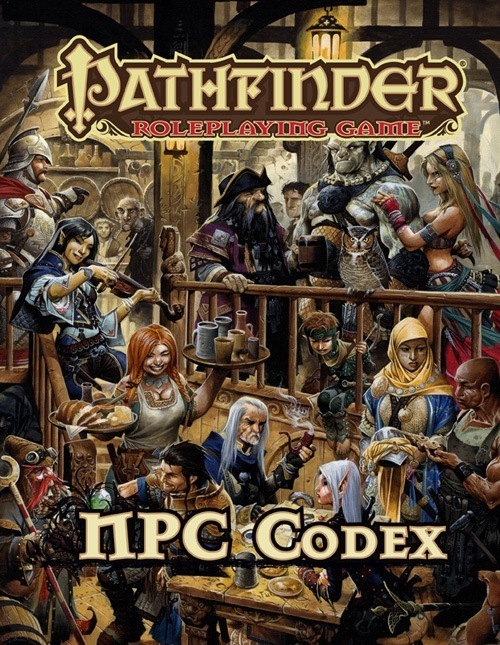 The famous “iconic characters” of the Pathfinder Roleplaying Game also come alive with statistics at various levels of development, providing ready-to-use player characters for any occasion. If you're referring to someone ELSE as the High Queen of Stab, well... someone needs a stabbin! They do a good job of keeping a variety of options presented in the hardcoers present in their other products, Adventure Paths especially, so I wouldn't be worried too much. For one of these books though, I couldn't really imagine needed a second one: the core base classes tend to be a bit more general, and I'd rather have 20 NPCs of any core class than APG classes. Also keep in mind that the reason this was a problem in 3.5 was because certain player classes (ones like Shugenja) didn't receive any extra options than presented in their book of origin as the line of products went on. Since this is just a book about NPCs, players who decide to take a less common vocation such as Inquisitor don't need to worry about lack of continued options or anything. Just that they're maybe less likely to show up as an NPC. But is that really a big deal? I have no interest in this product at all. If I want NPCs I tend to make them myself and besides I have multiple books from Paizo that have NPC stats in them. Would have much prefered a Bestairy 4 for the last hardcover of the year. I'm not super excited about this book, There are plenty of NPCs in the Game Master's Guide. But that might change if certain NPCs were included, NPCs like Ameiko Kajitsu, Shalelu, and Laori. Especially Laori. Aren't Ameiko and Shalelu statted up several times in the APs? I wouldn't count on it. Those are distinctively Golarion characters, and this is a distinctively world-neutral book. Unless we get an NPC Codex II using APG, UltM, and UltC, I am NOT a happy subscriber over this. If it takes us 320 pages to cover the Core Rulebook classes plus the iconics, it's easy enough to see that if we added the 10 core classes from the other three books, this book would have to be close to 600 pages. There are many reasons why (apart from the Core Rulebook) we won't be doing books that big, including postage costs and retail price sensitivity. As for an NPC Codex II? I'm sure we'll be looking at how well this one sells. The real reason is that Paizo knows that if they release a book that acknowledges the gunslinger class, the resulting nerdrage will consume the entire company and also a few other small businesses their HQ. What mix of races should we expect to see? Will the class mixes only draw from the core rulebook races too, or will you go further afield? To further expand on Vic's answer above. If the NPC codex does well, we'll certainly consider doing another one. We absolutely will NOT exhaust all there is to say about NPC stats in this one book. But the fact of the matter is that we have too may base classes to do them ALL in one book. Breaking that off at the Core (with 11 classes to fully represent) still gives us a sizable book, plus it also gives us a logical "break point" for that content. I'm not sure yet which of the iconics will make it into the book—certainly the 11 core iconics. Not sure about beyond that. Again... it's a matter of size and our capacity at this point to produce a book at that time that limits us to how many NPCs we put into it. In any event, I suspect that anyone who's looked at any of our modules or adventure paths or campaign setting books or, heck, Ultimate Combat or Ultimate Magic, will realize we do NOT use a fire-and-forget philosophy on our books. We mention things like alchemists and magi and inquisitors and oracles and the like a LOT. One NPC Codex that doesn't include them does not undo that fact. The NPC Codex, like all of our rulebook line products, are world neutral. As a result, specific NPCs from Golarion (like Ameiko or Shalelu or Laori) will NOT be appearing in this book. They're generic NPCs (with the exception of the iconics) who GMs can use in the same way they use bestiaries (which contain generic monsters). The NPC Codex will stay firmly rooted in the core rules for its builds. The race mix will be pretty varied—humans will make up the most of the NPCs, but we're hoping to spread things around pretty well among all the core races. Will there be a lot of new artwork for the iconics in this book? Are these NPCs going to be along the lines of the Gamemastery NPCs- ie, filling "generic" roles, or are they individual NPCs with names, histories, etc. (sort of a Shady Dragon Inn writ large)? I'm not really excited about a book like this, as I have NPCs enough already and can easily make my own from my own numerous ideas. But I'm also sure Paizo will make the book worthwile. More along the generic roles, I suspect. Again... world-neutral. We won't be inventing new locations to go along with these NPCs, any more than we do for new monsters like goblin dogs or boggards. OGL? Shouldn't it be PFRPG? I must confess that I am mildly disappointed that this is for CRB options only. If this does well and there is an NPC Codex II, I would like to see archetypes and APG/UM/UC classes presented there. My wife was much more excited about this one than I was anyway. EDIT: But, I am pleased that this product is being released. Paizo makes it easy for me to enjoy a more "lazy GM" style. May I request a solid representation of gnomes. The NPC Guide contained 1 gnome and he didn't even have a name. The rival guide contained 0 gnomes. By contrast, those two books combined contained 2 apes (one "uplifted dire", the other "sentient"). Possible way to resolve the CRB vs. not issue: Odd-level characters use only CRB options, even-level characters pull in some archetypes and the like from other sources, maybe tossing in a samurai, ninja, and antipaladin (since those are really just big archetypes rather than new base classes). That way other books are represented without overwhelming the CRB stuff, and there's plenty of space open for NPC designs using non-CRB base classes. Looking forward to this. Consider this my vote for an NPC Codex II for the other base classes. What will the point buys be for the iconics in this book? 15, 20, 25? The iconics will have 20 point buys, making them very easy to port over to Pathfinder Society. 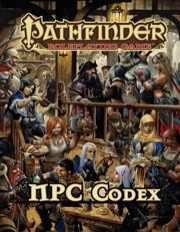 The plan is to use the stats presented in this book as the framework for expanded pregenerated characters with the requisite changes to their stats to fall in line with Society rules (like replacing Scribe Scroll with Spell Focus in Ezren's statblock, and bumping their hit points to match the number earned in organized play). Does this mean that the book won't have NPCs with NPC class levels? I was kind of hoping for more stat blocks of adepts, experts, etc. We're still paginating the book and figuring it out. If there's room, we'll put in some NPC class levels, but those will probably be the first things that get cut if we run out of room. So are the rest of the NPCs going to be 20 point buy or 15 point buy like other stat'd NPCs from other Paizo products? If they are 20, will the NPCs be PFS legal as well as the iconics? I'm just trying to get a good idea why I want to buy this book if only the pages of the iconics will be the only useful pages to me as a PFS player / GM. The rest of the NPCs will be standard point buy, just like all standard NPCs. The book itself is, as with a bestiary, primarily a GM resource. 1: (and it's not tied specifically to this product but please bear with me) Are NPC stats in most Paizo products based around a 15 point buy? 2: More specific to this product, can someone from Paizo work with someone from Wolf Lair to see that somehow, someway, the stats for these NPCs end up as HeroLab files? I have no issue whatsoever paying extra for this. I understand that not everyone uses HeroLab (though IMO anyone who can, should) so these would definitely be a separate item from the core product. The future of GM convenience is HeroLab, or something like it. A book loaded with NPC stats BEGS to end up in HeroLab files for mass consumption. There would be much GM rejoicing in the streets. Why can't the iconics be listed in a 64 page book instead? That way you could do the stats for non-Core classes as well. I'm fine with an NPC Codex, but I don't see how the iconics line up to be in this product, especially since their back stories are Golarion-specific (and this book is not). Their back stories may be Golarion-specific but the iconics themselves aren't. They've been used extensively in the setting-neutral books and are as much iconics for the game itself as they are for the Pathfinder campaign setting. 1: The iconics won't take 64 pages. 2: As I mentioned before, the 10 non-Core Rulebook classes would take hundreds of pages. You can't trade one for another. There's no reason they can't, except for the fact that such a book isn't on the schedule. Since we've already ordered all the statblocks and art for this book, however, we wouldn't have content to replace them with if we took them out. Just because the NPC Codex isn't the book you describe doesn't mean we'll never do a book more in line with what you're asking for. Considering their builds, it looks like those iconic pages are also reserved for "characters in a can" if you need a quick PC to play at a Pathfinder Society game or something. If that's their intention, I double that the space would go to adding the non-core classes; it would go to putting a quick-and-easy PC option set into the book. I have reservations about an NPC codex that focuses primarily on the core classes through levels 1 to 20. To qualify that, I don't mind that its just the core classes - but I do mind that archetypes aren't thrown into the mix. As a GM I want to see a large variety of builds and concepts - things that give flesh to ideas. Rather than 20 levels worth of core barbarian, I'd prefer 20 levels of varying barbarians (drunken rager, urban rager, savage, etc). What isn't clear from the excerpt and the discussion to this point, is to what extent the NPC codex goes into ideas. There'll obviously be a lot of stat blocks - but will each stat block be accompanied not just by tactics and moral; but also a "person". Creative, fun, dangerous personalities to give fresh ideas to GMs are just as important as regional guides.